A new match has been announced for the upcoming WWE Evolution PPV. 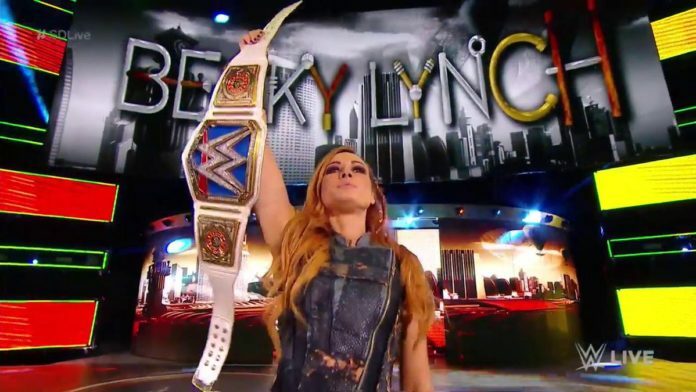 As seen on this week’s episode of SmackDown Live in Indianapolis, IN at the Bankers Life Fieldhouse on the USA Network, Becky Lynch defended the SmackDown Women’s Title against Charlotte Flair in the opening match, which saw it end by double count-out. Flair would then spear Lynch through part of the stage. Later in the show, SmackDown General Manager Paige announced that Lynch would defend the SmackDown Women’s Title against Flair in a Last Woman Standing Match at the Evolution PPV. Lynch and Flair also wrestled at Saturday’s (October 6, 2018) WWE Super Show-Down pay-per-view event at the Melbourne Cricket Ground (MCG) in Melbourne, Australia on the WWE Network that saw Lynch retain after being DQ once she hit Flair with the title. The Evolution pay-per-view event takes place on Sunday, October 28, 2018 in Long Island, New York at the Nassau Veterans Memorial Coliseum and will air on the WWE Network. What are your thoughts on this match being added to the card? Sound off in the comment section.